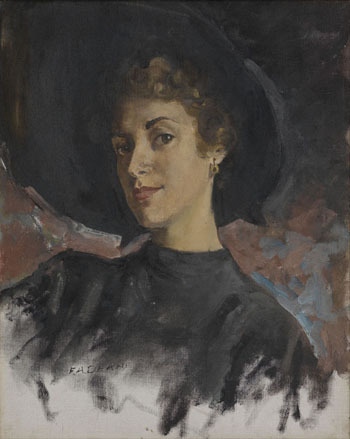 Frederick Deane, Untitled [Portrait of Rhona Lanzon], c. 1950, oil on canvas, 20 x 16 inches By permission of Nestlé UK and Ireland. Rhona Lanzon is now in her late 80s and lives in the Channel Islands. Lanzon studied Interior Design at University College London and between 1950 and 1960 worked in the Art Department of advertising firm J. Walter Thompson (JWT). She began her JWT career in a junior role liaising between the freelance artists and internal agency executives. Towards the end of the 1950s she took on senior responsibilities for client accounts, though she did not work directly on Rowntree campaigns. Whilst at JWT, Lanzon was picked out by George Butler, Head of Art, to be one of the faces of the Aero Girls campaign. She remembers that Butler was "always keen to use up and coming artists". She was put in touch with the young student artist Frederick Deane at the Royal Academy Schools in London. He painted her at the Royal Academy studios in 1950 when Rhona would have been in her early twenties. Lanzon was not paid a fee to sit for Deane, as she was painted during her contracted working hours for JWT. The hat she wears in the painting is her own and she recalls being "asked by either Deane or JWT to wear it for the portrait sittings". The painting was never published and is held the Rowntree & Co. Ltd archive at the Borthwick Insitute for Archives. Lanzon left JWT in 1960 to work on interior design projects for an architect in Jersey. She had always wondered what had become of her portrait and still keeps a black and white photograph of it at her home.